By Xah Lee. Date: 2016-01-07 . Last updated: 2018-10-20 . 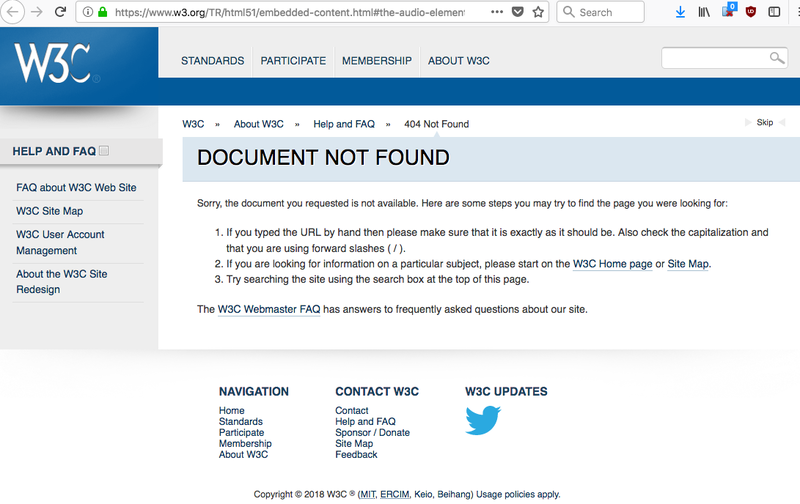 The whatwg.org and now also w3c URLS now also constantly 404, no redirect. http://www.w3.org/html/wg/drafts/html/CR/document-metadata.html#the-style-element, was good on 2014-09-13 , dead in 2016-01-07 .
http://www.whatwg.org/specs/web-apps/current-work/multipage/scripting-1.html, was good on 2014-04-20 , dead in 2016-01-07 .
whatwg broken link. http://www.whatwg.org/specs/web-apps/current-work/multipage/scripting-1.html, was good on 2014-04-20 , dead in 2016-01-07 .
i've been linking to spec URLs for 15 years. FSF, python, go 404 every few years. Companies, Sun java doc, Apple tech doc, also go 404. Now, w3c, and whatwg too. starting few years ago, the w3 site start to have dead links. e.g.